Social studies standards, including history, geography, economics, and government and citizenship are required for statewide accountability (Minn. Stat. § 120B.02, Subd. 1). The 2011 Minnesota K-12 Academic Standards in Social Studies set the statewide expectations for K-12 student achievement in the disciplines of citizenship and government, economics, geography and history — United States and World. Minnesota State Statute requires all students to satisfactorily complete all social studies standards and corresponding benchmarks in order to graduate (see Minn. Stat. § 120B.024, Subd. 1(5)). The 2011 Social Studies Standards will be reviewed in 2020-21 and every ten years thereafter (Minn Stat. § 120B.021). The 2011 Minnesota K-12 Academic Standards in Social Studies represent the minimum requirements; schools may offer courses in additional disciplines including psychology, sociology, and anthropology. In addition to the state social studies standards, there are standards for Literacy in History/Social Studies included in the 2010 Minnesota K-12 Academic Standards in English Language Arts. Minnesota frames student learning for social studies according to K-12 anchor standards and corresponding benchmarks. 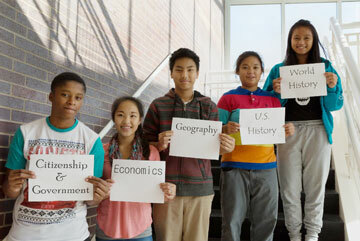 What are the components of the 2011 K-12 Minnesota Academic Standards in Social Studies? Watch this 4.5 minute Powtoon video for an overview of anchor standards and benchmarks. Learn about the background, organization, and components of the 2011 Minnesota K-12 Academic Standards in Social Studies. This series of videos supports implementation of the social studies standards. In 2016, the Minnesota Legislature passed a law requiring Minnesota students in public schools to correctly answer 30 of 50 civics test questions selected by the Learning Law and Democracy Foundation. Read this FAQ document to learn more about this legislation.